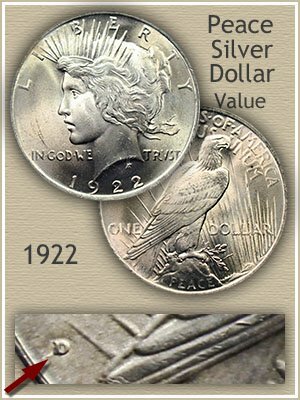 Your 1922 Peace silver dollar value, currently worth a minimum of $17.87 today, is well above its silver melt price. Recognizing your coin is "uncirculated" in condition, versus one with wear to the surface, is important to an accurate appraisal of even higher value. Pictured is a 1922 Peace dollar that never entered circulation, displaying undisturbed, as minted luster. As reflected on the chart "uncirculated" condition defines a major breakaway point in price. To help judge this difference, see the grading images below. Also a very rare Gem condition Denver minted Peace dollar is highlighted, with an amazing price. An opportunity for you. Premiums in price of silver dollars above their underlining silver value have over time been rising. An expanding spread is a reflection of both their popularity as a collectible and as a popular way to own silver. 1922 Peace dollars, large and heavy with silver, are prized by collectors and also bullion investors, keeping values strong. Mintmarks on 1922 Peace dollars become a factor in value if your coin is in uncirculated condition. Three mints produced silver dollars that year, Philadelphia, Denver and the San Francisco mint. Mintmarks used to distinguish the mints were place on the reverse. Denver used a "D" mintmark, San Francisco an "S." Philadelphia, the main mint did not use a mintmark. Preserving coins in top condition has provided collectors with some really outstanding gem specimens. Holding your coin only by the edges, protecting from both damage and the elements really pays off. Pictured is a stunning example of fortunate circumstances and intentional careful preservation. Quickly recognized as having exceptionally full details because of a strong strike, this 1922-D Peace dollar is highly valued today in thanks to thoughtful care. Placed in a David Lawrence rare coin auction, it reached $690 as the high bid. A combination of superior luster, bold details and scuff free surfaces attracted discerning silver dollars collectors. Handling your coins gently, separating and storing individually the high condition examples, is a big step in maintaining value. 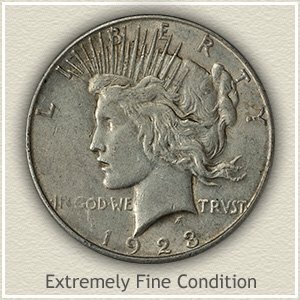 Currently there is little difference in value from one circulated "grade" 1922 Peace dollar to the next. However if you are intending on keeping all or just one it is important to identify a better condition coin as the one to save for the future. 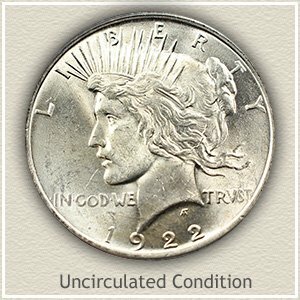 Uncirculated: Absent of wear defines the "uncirculated" condition. Looking closely at your coin, mint luster is a fragile element to a coin's surface, it's what gives a coin brilliance. Because of its delicate nature it is the first to show signs of wear. Rotating your coin under a light, luster should remain unbroken from rim to rim. A dulling of the silver color on Liberty's cheek and neck is a good indication of wear. 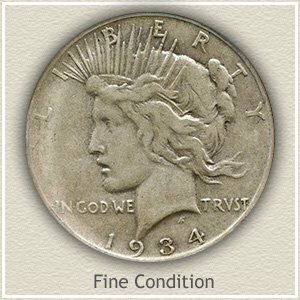 Extremely Fine: As a Peace dollar begins to show light amounts of wear collectors grade the condition as "extremely fine." The hair trailing behind Miss Liberty's neck is one of the high points of the design, wear begins here quickly and creates a flattening appearance of the curls. Hair directly above the eye is another place to examine, a small flat spot is acceptable for the grade. Fine: Wear has smoothed and reduced metal over all parts of design. 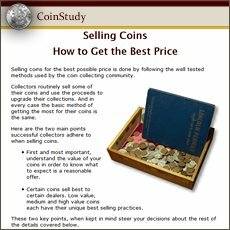 If not to severe your coin is in "fine" condition. Detail within the hair is still visible, major strands are still separated, although the finer strands have merged. Liberty's cheek and neck now displays a few areas of flatness. Stepping back the impression is a coin with moderate wear but pleasing. Good: With noticeable heavy wear and complete lack of fine detail this coin is now considered as "good" condition. What was once bold lettering, hair strands and rays are now quite shallow in relief. 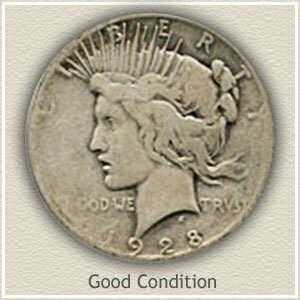 1922 Peace silver dollar value of coins with heavy wear are unfortunately destined to remain low in demand as a collectible. Enough high condition examples are available to fulfill collector's needs. They are however very popular as a bullion silver coin, and currently in demand. 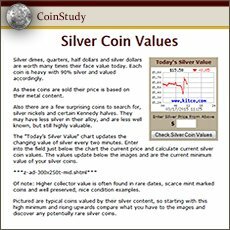 Visit the index page to coin values of all series, from Pennies to Gold coins. Value charts, combined with grading images and descriptions help you separate the common from rare. Discover what is in your box of old coins.